Hana, a student at Tokyo University, is intrigued by a mysterious man who sits in on lectures despite not being registered to attend. Before long, they fall in love and she discovers that he is a wolf-man; he has the blood of both man and wolf and, as wolves have been extinct in Japan for many years, he is the last of his kind. Before long, they bring two children into the world – Ame and Yuki – who begin to display wolf characteristics, and as such may need to be brought up away from the outside world. As they grow older they will have to deal with their differences and decide which path to take. This beguiling, lyrical anime is a departure of sorts for Mamoru Hosoda who takes a fantastical idea and makes it irresistibly touching and relevant without ever becoming a mere genre piece. 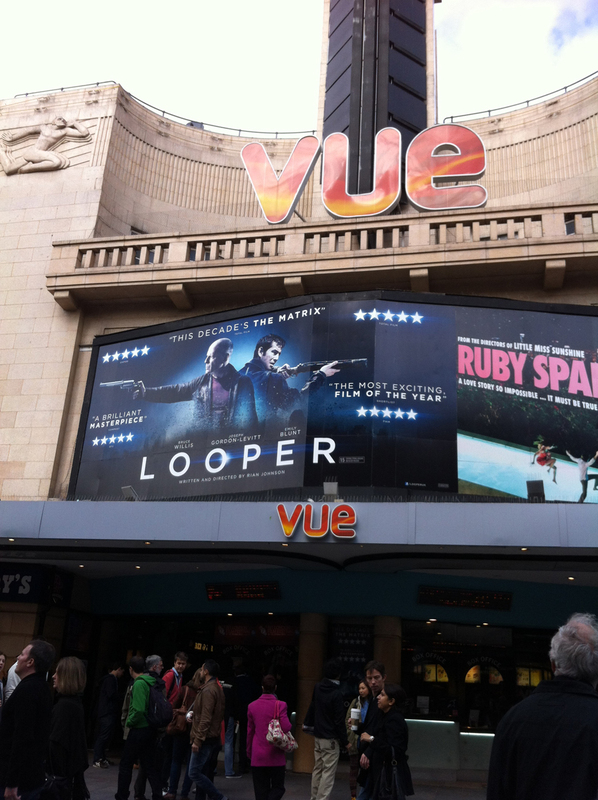 We picked a Saturday screening in Leicester Square's Vue cinema. There was absolutely no advertising for the film (not even a mention on the schedule at the venue) so my plans to get a relevant photograph for this entry fell through immediately. It was like a secret event. 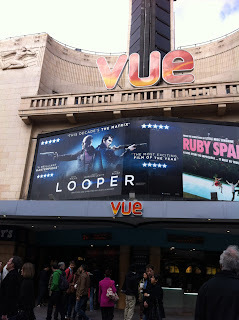 The BFI's advertising had worked its magic though and there was no need to worry, the entire theatre room was packed with viewers. There was a good mixture of local people in the audience, from young children with their families to hardened anime fans. With the screening being part of a special film festival, it's likely that most of the attendees loved cinema a little more than the average person, and accordingly peels of laughter could be heard whenever something funny happened in the film and there was excited applause once it had finished. It was good to see Wolf Children being received so well over here. The cinema staff were unusually courteous too when everyone was leaving. It was a good event. The film itself was splendid, my favourite so far of Hosoda's works. I had deliberately avoided reading any reviews before the viewing, so early on in the main story I suddenly had misgivings; would Wolf Children fall into the usual pattern of most western-style feature films and require a big confrontation of some kind to serve as a climax? It did not, and stuck firmly to its premise without adding any distracting conflict or preachiness to the story. Despite wolves featuring centrally, the characters are extremely 'human', likeable and easy to understand - rooting for them came naturally. The plot isn't complicated at all, but it invites the viewer to think upon it more if they'd like, to take the fantasy scenario as an allegory. Accordingly I felt as though I should dwell on the movie for a while after the credits rolled, absorbing the emotions fully and emphasising with the cast. It was surprising how much it moved me. Modern western movies rarely feature characters I can relate to at all. Here I could see aspects of myself and people I care about in Hana, Ame, Yuki and the others, so I was swept into their problems without having to think twice. To say that Wolf Children was the most enjoyable Hosoda film so far is high praise. I look forward to the Blu-Ray release.